A good cube can turn quickly and firmly, will not get stuck or scatterred, compatible all sorts of techniques. This GIIKER Cube can meet your needs once for all. First of all, built-in 48 strong magnets with powerful performance, it can be aligned automatically with a flick of the dial. Innovative movable magnetic module design brings a stronger sense of the sound of magnetic suction. In addition, App Teaching Guide, Easy Learning, This product can be used with the "Giiker" APP. (Search Giiker on mainstream app stores). There are a large amount of free and high-quality contents of magical cubes. It is a good assistant for the introduction and advancement of newbies. 1, PLS Note that GIIKER Comes from Xiaomi Eco-Chain, there is no xiaomi logo on it. 2, NO BT sensors inside, NO connection of APP and phones, but you can refer to the tutorial on app or other methods to learn and play. Product Size: 56.5mm x 56.5mm x 56.5mm. Professional Game Size Speed magic cube. 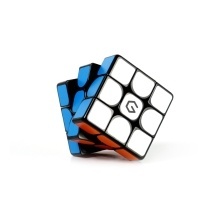 Great for speedcubing and competition. Stability: good stability, rapid rotation without turbulence. Great Hand Feeling: Smooth and high speed. Best Magic Cube, can company you for years.